Scroll down the page for E-Bike mirrors. I sell Cycle Star bicycle mirrors from Busch & Müller that mount on your handlebar. 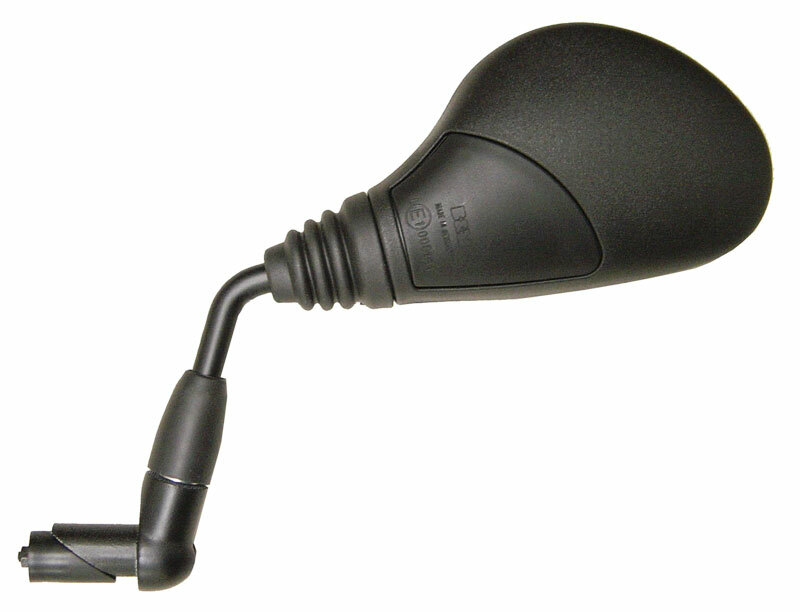 The mounting system includes two styles of attachment. One allows the mount to be inserted into the end of the handlebar and the other wraps around the bar, like a hose clamp. All hardware is included, see the photo below. The slightly convex mirror gives you a wide view of the road behind. All mirrors offer a wide range of adjustment. There is a ball joint at both ends of the arm, and the base can pivot on the mount. Many cyclists need the longer are version (901). Others will prefer one of the shorter versions (901/1) since the shorter arm will vibrate less on rough roads and the image in the mirror will be a bit more stable. And if you're a true minimalist, the 901/2 will be ideal. I use the 901/2 on my road bike, it's perfect at the end of a drop bar, unless you use bar-end shifters, of course. The various "901" Cycle Star mirrors are convex and 55mm in diameter. New for 2013, we have a larger mirror available. The Cycle Star 80 903 series mirrors use the same mounting system and arm options, but the mirror is about 81mm in diameter; also convex. The curve or radius of the new 903 mirror is a bit less than the radius of the 901. In other words, while the 903 is still a convex mirror, it's slightly less convex than the 901. With the 903 series, you see a wider field of view, and, the size of the image is larger. Well shucks, I dunno! I have the 901/2 on my own bike, and I like it a lot. I can easily see if an approaching car is far enough to the left not to hit me. But perhaps you'd prefer a larger image of the car approaching. Hard for me to say. I don't think I'll be changing to the 903. I like the minimalist look of the 901/2 on my bike. Update, Feb 2018: Well, I did get a 903/2 and put it on the left end of the handlebar of my Rambouillet. I moved the 901/2 to the right side. So now I look like one of those old geezers with two mirrors on his bike. And that's appropriate since in fact I am an old geezer with two mirrors on his bike. 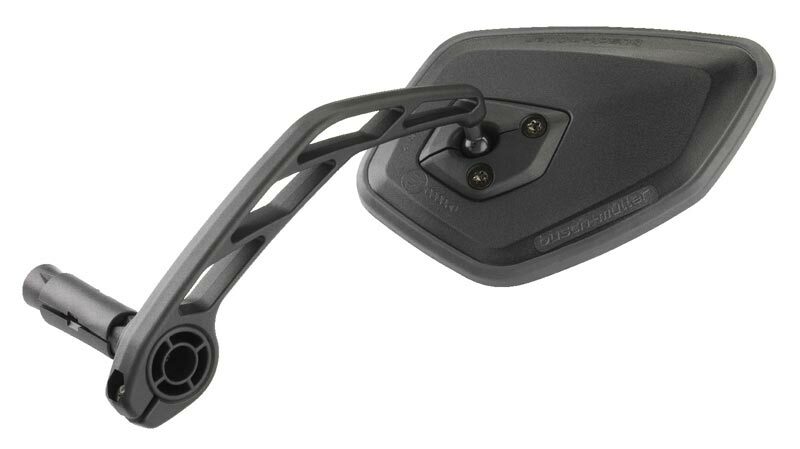 The Cycle Star 901 handlebar mirror from Busch&Müller either plugs into the end of your handlebar, or wraps around the bar, whichever you prefer. The 5.5 " gently curved arm is best for positioning the mirror well to the side or high above the handlebar. The mirror comes complete with the hardware pictured below. The Cycle Star 901/1 from Busch&Mueller either plugs into the end of your handlebar, or wraps around the bar, whichever you prefer. The 2" straight arm is best for positioning the mirror behind and a little above the end of a drop style road handlebar. The mirror comes complete with the hardware pictured below. 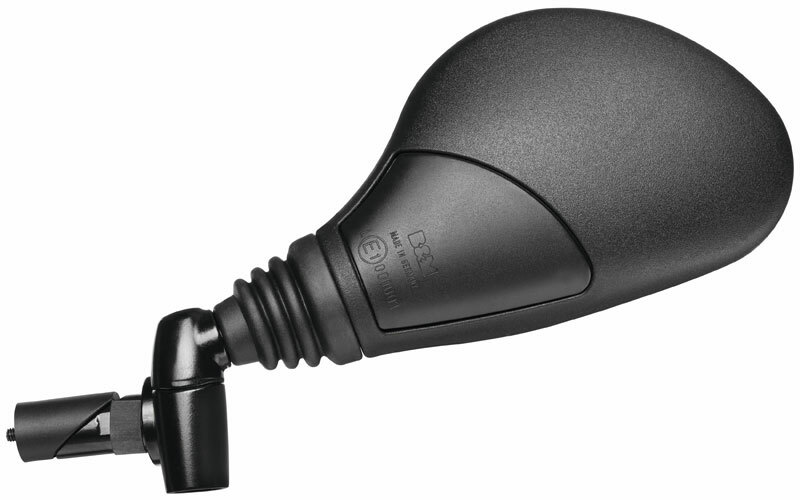 The 901/2 and 903/2 plug into the end of a handlebar. On my road bike, a Rivendell Rambouillet, I don't have bar end shifters, so the bar end is free for a mirror. I use the 901/2. It's perfect for me. The Cycle Star 901/3 from Busch&Muller either plugs into the end of your handlebar, or wraps around the bar, whichever you prefer. 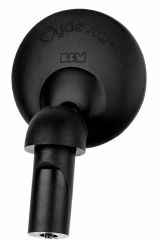 The 2" curved arm is best for positioning the mirror to the side of or below the end of a drop style road handlebar, or on the end of a straight mountain bike handlebar. The mirror comes complete with the hardware pictured below. 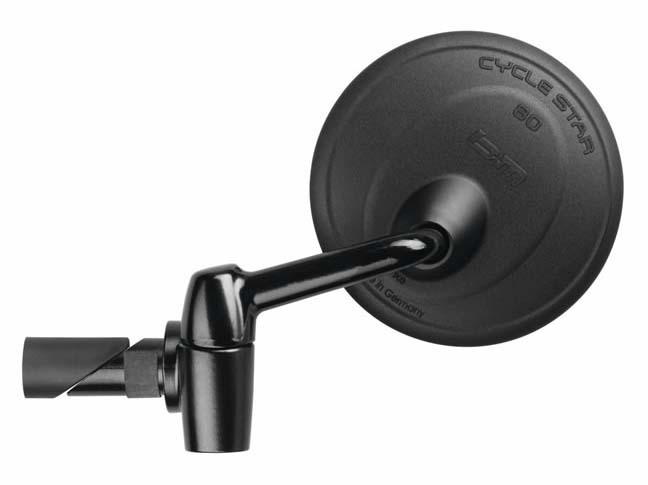 This is the mounting hardware included with each Cycle Star mirror except for the 901/2 and 903/2, which include just the section to insert into the bar end. One mount (on the left) inserts into the end of the handlebar. The other (on the right) wraps around the bar. This is also helpful if you first set up the mirror with one mount, and then for whatever reason want to change the mount to the other style, but in the mean time, you've misplaced the other mount. Busch & Müller makes several types of mirrors for E-Bikes. The 701 is available only for left side mounting, and the bottom of the mirror is at about the same height as the top of the hand grip. 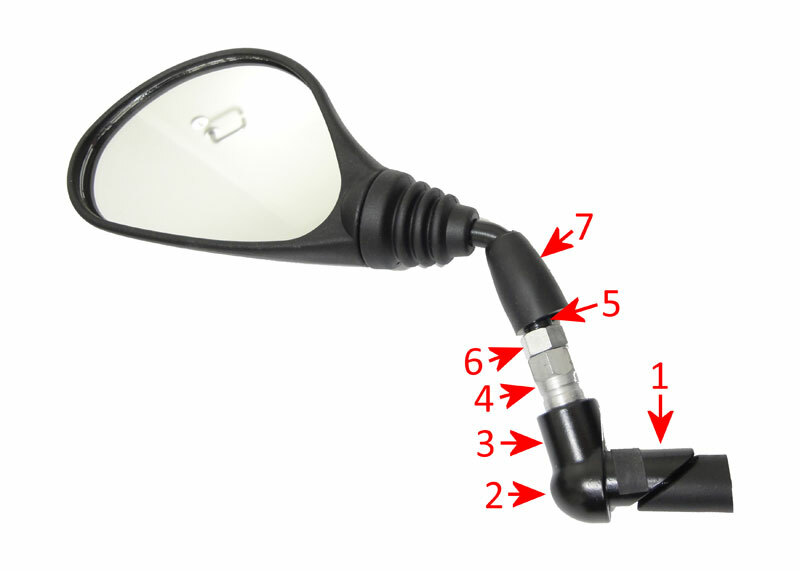 The mirror plugs into the end of the handlebar and is tightened with an allen bolt. The mount pivots on a vertical axis just outside of the handlebar, so that if you get too close to that bus, you know, that bus you're passing on the right and the driver turns into the bus stop? Yeah, that bus! Well, when you hit the bus, or the bus hits you (We don't have to have that debate here. I've got a forum on Google for that.) the mirror can pivot on that vertical axis and is far less likely to be damaged. You just swing it back into its normal position. It will just click into proper alignment. Pretty nifty, I'd say. The long dimension of the mirror is 115mm. Busch & Müller also makes a less expensive mirror that also sits up a bit higher, the 801. The 801 is available for left side as well as right side. The 801 will also pivot when you hit, um, I mean, when the bus hits you. But the simpler mechanism requires you to re-aim the mirror. Takes about 15 seconds. 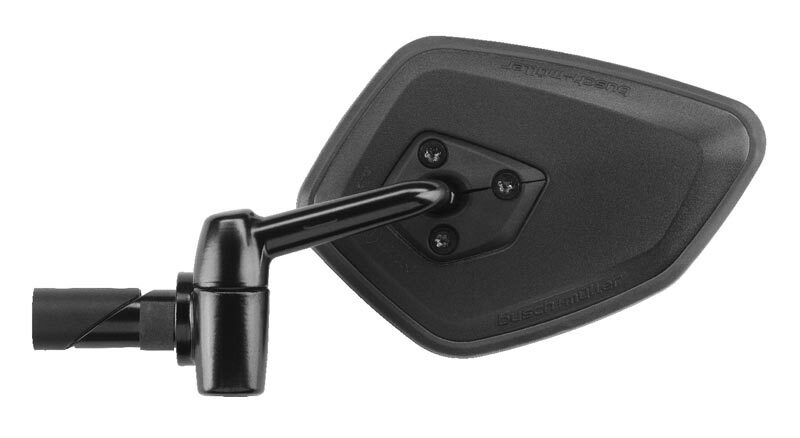 (#1) is the expander plug for attaching the mirror to the end of the handlebar. (#2) is where you'll find the head of the allen bolt to tighten the expander plug. (#4) a special bolt with a right-hand male thread at the bottom end, and a left-hand female thread at the top. Since there's a right-hand thread as well as a left-hand thread in that stack, if the mirror is bumped from the front or from the rear, it can turn free on its threads. Then you can just tighten it back by hand after a brief chat with the nice bus driver. The long dimension of these mirrors is 115mm. 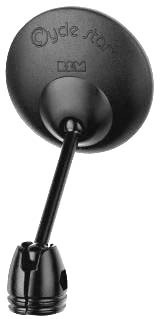 Busch & Müller 801 mirror for E-Bike, left side, Part # B&M913801VLME, Price: $ 30.50 In stock. Busch & Müller 801 mirror for E-Bike, right side, Part # B&M913801VRME, Price: $ 30.50 In stock. The 903/7 can fold flat. 80mm convex mirror. Bar end mount. Left side only mounting for any upright handlebar on regular bike or E Bike. The 903/6A has a long arm made of a composite material. Highly adjustable. 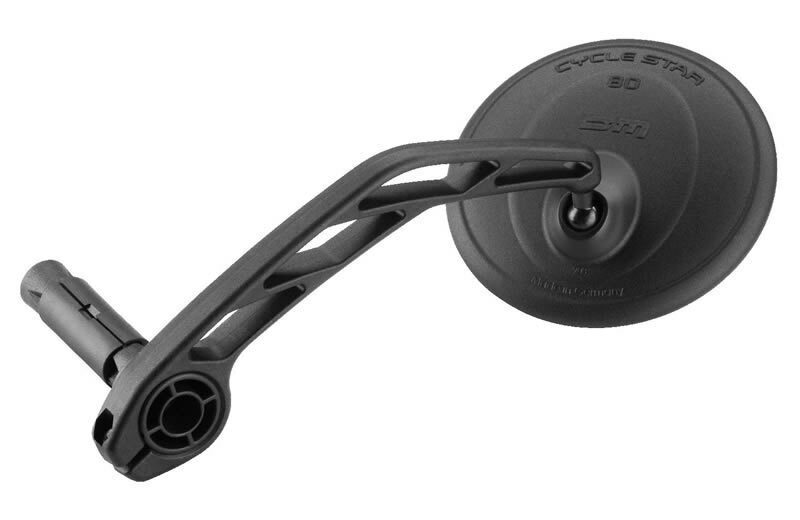 Right or left side mounting for any 22.2mm outside diameter upright handlebar on regular bike or E Bike. Cycle Star E has a large, five sided convex mirror for a very large field of view. Two types of mounts. The long dimension of the mirror is 124mm. Cycle Star E 913/712 has a pivoting mount. Left side mounting only for upright bar on E Bike. 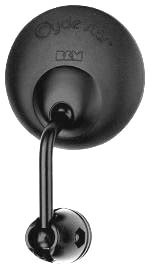 Cycle Star E 913/612A has a tall and highly adjustable mount. Left or right side mounting for any upright bar on regular bike or E Bike. Can clamp to any 22.2mm outside diameter handlebar. Dealer inquiries invited. Call 603 478 0900 to set up a dealer account.